Septic Tank Or Grease Trap Problems? Help Is On The Way! Septic tanks and grease traps should be cleaned regularly to prevent the premature failure of your septic field and promote proper drainage. Almost all of the time, we take our septic system for granted.. until it starts to fail. Take control of your Septic System today! Failing septic systems don’t always have to be replaced. Most of the time our plumbing Bundaberg services can ‘resurrect’ your system and then keep it going well into the future with regular maintenance of the soakage trench. How can I extend the life of my Septic Tank System? A failed septic tank system can cost well into 5 figures.. Don’t take that risk — keep your septic trench and grease trap in good working order with our annual maintenance program. Home owners and Business have trusted us to keep their drains running for many years now. We have become known as a top-quality and reliable operation that can handle any task affordably and efficiently and that’s a reputation that we’re very proud of! What Causes My Septic Tank or Grease Trap to Overflow? The main causes of blockages and/or failure of septic systems and grease traps are neglect and poor maintenance. Nuflow Wide Bay can restore blocked or failing systems to a working condition with a combination of high-pressure jet cleaning & root cutting, and CCTV drain camera inspections of the soakage trench drain. Grease trap rubble trenches usually block up when the grease is allowed to build up to such an extent in the grease trap that the grease and fat solids make it through the outlet of the grease trap and into the rubble trench, blocking up the slots in the soakage trench pipes. Get in touch with one of the best plumbers Bundaberg. Tree roots often run rife in septic tank rubble trench drains as they provide the perfect conditions that the plants are seeking – Warm, moist soil that is full of fertiliser! How Can I Stop Tree Roots Getting Into My Drains? With an annual maintenance schedule in place we can significantly extend the viable working life of your septic system and with a treatment of RootX we guarantee that roots will not grow back within 12 months, or well treat it again for free. Book an appointment or request a quote. It’s non-caustic, non-fumigating and non-systemic, and it contains no diquat dibromide, copper sulfate or metam sodium. RootX will not harm pipes, septic systems or above-ground vegetation. For the chemists and the curious – RootX Kills the roots using the aquatic herbicide Dichlobenil. Click To Call Sam Now! Rang another Plumber but said they could not unblock our Septic Outlet for another week or so. Rang Sam at Nuflow Wide Bay and he said he would be our place in 30 minutes or so. He arrived on time and all geared up to do the job. He did an outstanding job identifying and fixing our problem, had all the right gear and knew how to use it. 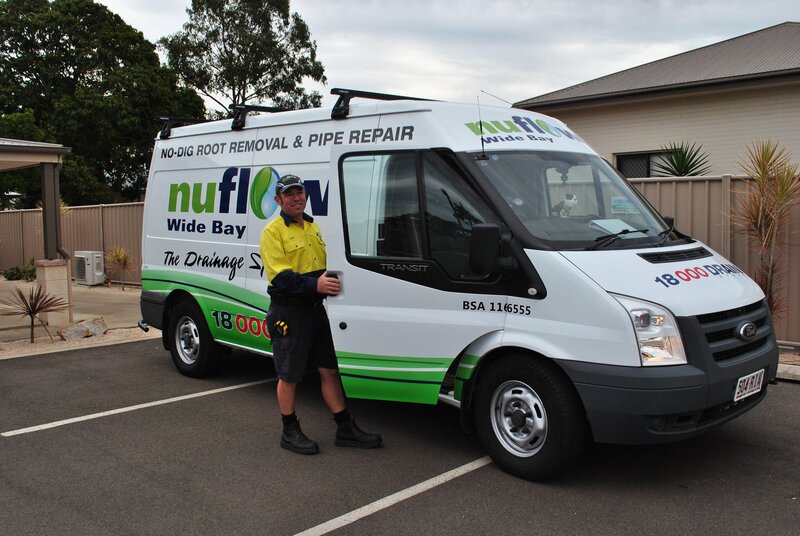 Definitely would recommend Nuflow for any drainage and Septic Tank problems. Thanks again Sam. Work myself but after trying a Bunning's drain cleaner tool to no effect I called Nuflow. They were there in 40 mins approx. 5 separate root balls between 10 and 13 meters down. They make sewer blockages FUN! Very prompt and professional service! Would highly recommend this business if you want a reliable and reasonably priced plumber, who gets the job done without delay. Very fast response. Mike was very professional and skilled. Very, very happy!